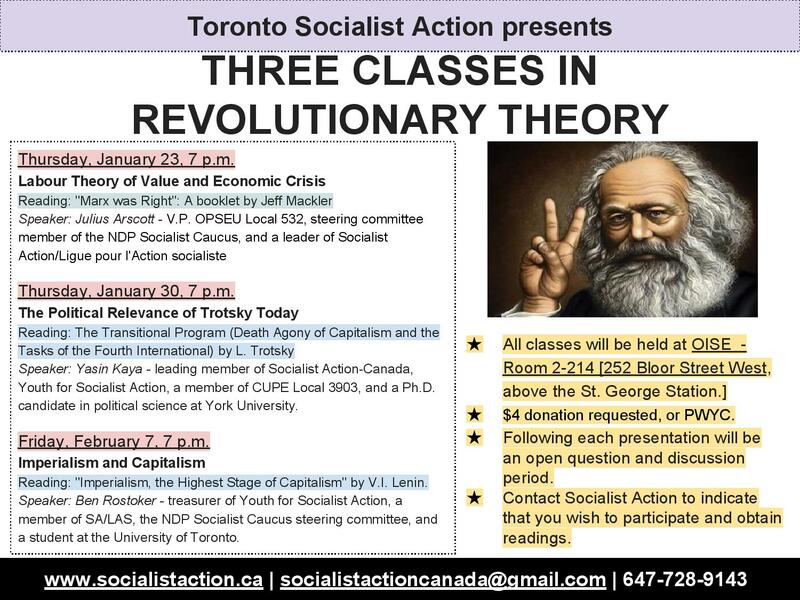 Thursday, January 23, 7 p.m. Labour Theory of Value and Economic Crisis. Reading: “Marx was Right”, a booklet by Jeff Mackler. Speaker: Julius Arscott – V.P. OPSEU Local 532, steering committee member of the NDP Socialist Caucus, and a leader of Socialist Action / Ligue pour l’Action socialiste. Thursday, January 30, 7 p.m. The Political Relevance of Trotsky Today. Reading: The Transitional Program (Death Agony of Capitalism and the Tasks of the Fourth International) by L. Trotsky. Speaker: Y. Fikret Kayali – leading member of Socialist Action, Youth for Socialist Action, a member of CUPE Local 3903, and a Ph.D. candidate in political science at York University. Friday, February 7, 7 p.m. Imperialism and Capitalism. Reading: “Imperialism, the Highest Stage of Capitalism” by V.I. Lenin. Speaker: Ben Rostoker – treasurer of Youth for Socialist Action, a member of SA/LAS, the NDP Socialist Caucus steering committee, and a student at the University of Toronto. All classes will be held at OISE U of Toronto, Room 2-214, 252 Bloor Street West, on the Bloor Street subway line, above the St. George Station.$4 donation requested, or PWYC. Following each presentation will be an open question and discussion period. Previous PostFILM SCREENING: Quietly Into DisasterNext PostRally and March for Global LGBT Equality!